The viral Bird Box challenge: it's a walk in the dark. 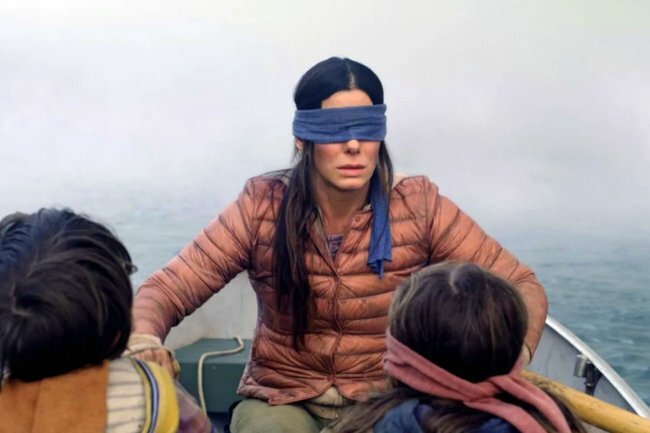 'Bird Box Challenge' is now a thing and Netflix is warning you not to try it. If you’ve been online this week, you’ll probably know that most of the world is obsessing over Netflix’s new thriller Bird Box. Released just before Christmas, the film’s basic premise is that a woman and her children are living in a world in which they must be continually blindfolded, or they will die. Even though Kim Kardashian is still playing catch up with the phenomenon, the rest of the world has taken things to the next level. They’ve meme’d the crap out of the concept of being blindfolded, as to be expected. And of course, they’ve created a new challenge inspired by the movie, creatively called the ‘Bird Box Challenge’, which is going viral on Twitter. The challenge is so simple, it’s a walk in the…dark. (Wow, how clever am I?) Basically, it involves people doing stuff, wearing a blindfold. Listen as we unpack Bird Box on our Recap podcast here… Post continues after audio. In probably the most disturbing example, one viral video shows a blindfolded man leading two blindfolded kids through a house. This video, and others which similarly involve children, have prompted Netflix to issue a warning, imploring viewers, “PLEASE DO NOT HURT YOURSELVES”. “We don’t know how this started, and we appreciate the love, but Boy and Girl have just one wish for 2019 and it is that you not end up in the hospital due to memes,” the company tweeted. One would think that’s a given, especially when children are involved, but then again, have you met the internet?